Oh, the holidays…I anticipate them year round. In my household, I play Christmas music even in the middle of summer and the Christmas tree, this year, went up weeks before Thanksgiving! Obviously, I looooove Christmas. Since the subject of my blog is anime and Christian spirituality, I thought it would be most appropriate to discuss Christmas in terms of anime this season. 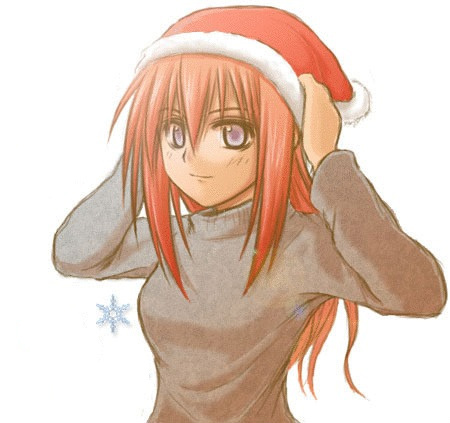 And so, for the next 12 days, leading up to and including Christmas, I’ll blog about one anime Christmas episode a day. These aren’t in any particular order, and though I’ve watched all the episodes, I haven’t necessarily seen the entirety of each series. Enjoy the list, and have a wonderful Christmas! And remember the reason for the season. Note: Gunblader at Otakulypse has already been writing a 12 Days of Christmas series of posts which go further in-depth than my own. And on her excellent site, Poo-chii is running with what anibloggers often do, and that’s making 12 Days of Christmas a reflection on 2010 anime moments. Another listing I’ll be reading is Tim Ng’s at Black Mage Shooter. There are bound to be scores of others – check them out and get in the Christmas spirit! Tomorrow’s Forecast: Chance of magical girl flurries. Edit: Dangit! I accidentally published the first day already. The wonders of auto-scheduling! It’s down now, but even if you already saw it, please come back and read again tomorrow – ha! Oh, I’m doing a 12 Days as well! Of course mine started today, along with Valence’s.